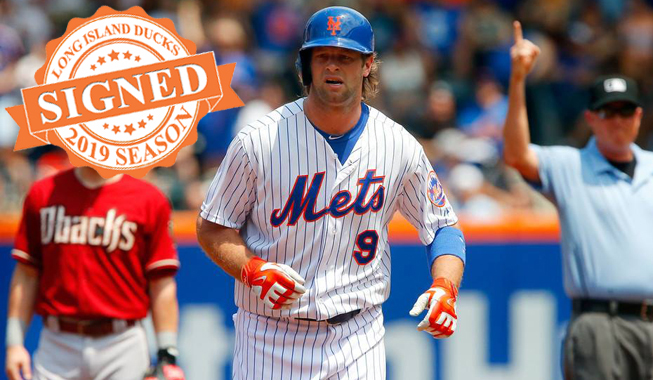 (Central Islip, N.Y., March 19, 2019) – The Long Island Ducks today announced the signing of outfielder Kirk Nieuwenhuis. The six-year MLB veteran enters his first season with Long Island and 12th in professional baseball. In 2015, Nieuwenhuis helped the Mets reach the World Series after playing in 64 games with the club. On July 12th of that year, he launched three home runs in a single game against the Arizona Diamondbacks at Citi Field, becoming the 10th player in Mets history to accomplish the feat but the first to do so in a home game. The 31-year-old’s best MLB season came in 2016 with the Brewers. He appeared in 125 games, accruing 13 home runs, 44 RBIs, 38 runs, 18 doubles and 56 walks. The Azusa Pacific University alum spent the 2018 season with Triple-A Tacoma in the Seattle Mariners organization, totaling four homers, 31 RBIs, 39 runs, 17 doubles and 48 walks over 80 games. During his previous minor league experience, “Captain Kirk” was named an MiLB.com Organization All-Star and a Mid-Season Eastern League All-Star with the Mets in 2010. He also earned both Mid-Season and Post-Season Florida State League All-Star honors in 2009. Nieuwenhuis was originally selected by the Mets in the third round of the 2008 amateur draft.